Beautifully shot and well-directed, Looper takes the theme of time travel into a deep level. It would make you think and ponder about how one action can directly affect everything in the future. The year is 2044, and during this time, organized crime has grown and extraordinary mutation is present in 10% of the population. Thirty years in the future, time travel would be invented, and powerful mafia bosses would use it for their illegal activities such as dispatching people they wanted dead. Loopers, hired assassins of the mafia in the present, would kill and dispose these people that have been sent to them from the future. In the contract of looping, they would also be sent back to the past after 30 years to close the loop, by killing them as well. Joe Simmons (played by Joseph Gordon- Levitt), a young looper whose future self (Bruce Willis) escaped before he could close the loop, must find a way to settle something that really matters. He has to know, though, whether it is himself, his old self or the future of the world? I immediately noticed in the movie that some scenes register greatly onscreen. The director, Rian Johnson, has his way of showing how simple things could seem more beautiful than the way they are. The filth of the city setting and the raggedness of the suburb setting could be felt through the visuals. Watching the movie did not feel like it was 2 hours long. There were scenes necessary to be fast-paced, some to be slow-paced, but it all worked well in the end. The suspense built up early on and it continued until its breath-taking climax. The ending was not that surprising, but it justified everything the main characters were doing. I must admit, though, that the movie’s visual effects weren’t at par with those of some of the biggest summer movies of this year. Some scenes that needed special effects weren’t presented smoothly. Nevertheless, there were a few that stood out. The best one for me came out right at the climax part of the movie. It’s fascinating how Joseph Gordon- Levitt could look like Bruce Willis as both actors took on the roles of the main character. Even though there were scenes where this wasn’t apparent, the way Gordon- Levitt acted sealed the deal. His character as the younger Joe had the meatiest part in the story, and he’s able to play it out really well. But it’s not only him who was outstanding in the movie. The other outstanding actor in the movie was no other than Pierce Gagnon, the child actor who played a significant role in this time-travelling story. This child’s so expressive with the way he moved parts of his face. His eyes told a lot about the emotions he wanted to convey. 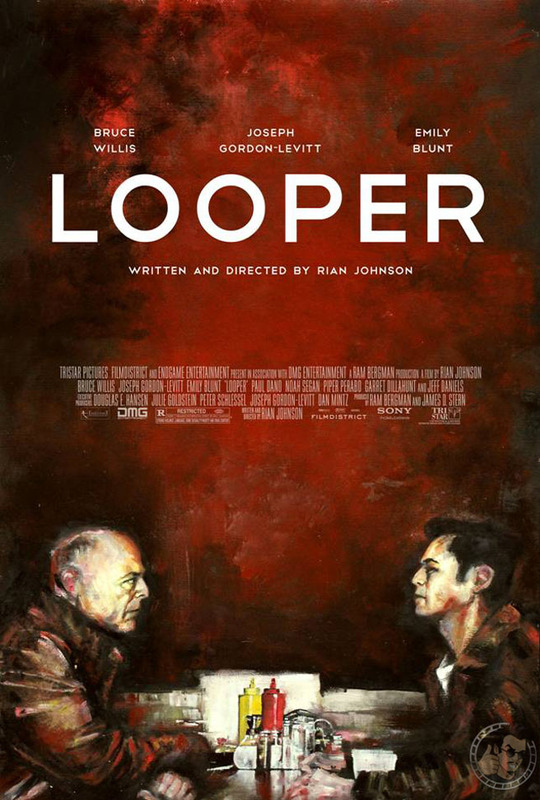 I may not consider “Looper” as a great movie, but it’s way better than many of the sci-fi movies that I have seen. I’ve noticed that American horror movies have been improving for the last few years. A few months ago, I have raved about how great Cabin in the Woods was. Several weeks ago, I mentioned that V/H/S was a one-of-a-kind horror movie that would surely make many people scared. This time, I’d praise the latest American horror flick that I’ve watched onscreen, and it’s aptly title Sinister. 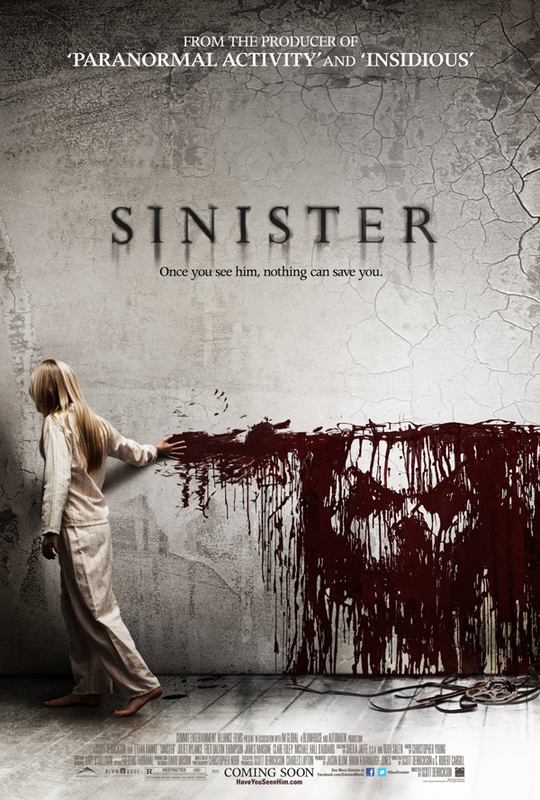 Sinister was one of those rare deeply frightening flicks that every horror fan should watch. Believe me; it would frighten everyone who’s watching at least once during its run. I, who has been watching horror movies for most of my life, have genuinely cringed during a few scenes in the movie. Some of the people I was with during the screening were definitely horrified by some scenes based on their squirms and wails. There was also one time when several people in the audience jumped from their seats because of a truly scary scene. I applaud Scott Derrickson (The Exorcism of Emily Rose) for making the overused theme of demon curse worth watching in a genre that’s relatively new: found footage film. He certainly succeeded as the movie’s director, for what was meant to frighten everyone watching has really frightened everyone who’s watching. I also want to congratulate the special effects team for bringing into life amazing visual effects that certainly maximized the horror of the story. The manner in which the devious events were portrayed was really frightening thanks to their skills. Imagine scary things happening on things you really don’t expect scary things to happen. Meanwhile, I also liked how the production team inserted drawings that depict cult symbolism. They surely added scare factor to the already creepy atmosphere of the movie. Ethan Hawke, the lead actor in the movie, was great as an obsessed true crime writer whose passion to his work led his family to face an unimaginable terror. He’s able to perfectly capture both roles of a seemingly selfish and obsessed-crazed writer and a good family man. Among the supporting cast, the child actors who did crazy stuff in the film take the cake for having some of the creepiest and most diabolical scenes. The movie ventured into an age-old story of a Pagan deity called Bughuul, which was said to eat souls of children, kill their families and abduct the children as his own. Ellison Oswalt (Ethan Hawke), a true-crime novelist, dared to live and carry with him his family in one of the houses where one of the family massacres he was investigating for a new book happened. He would soon discover that the demon was the real cause of the demise of his subjects. The question now is, would he still continue his investigation for the sake of writing and knowing the truth? And, would it all be worth it until the end? Those questions would be answered by the movie’s end. 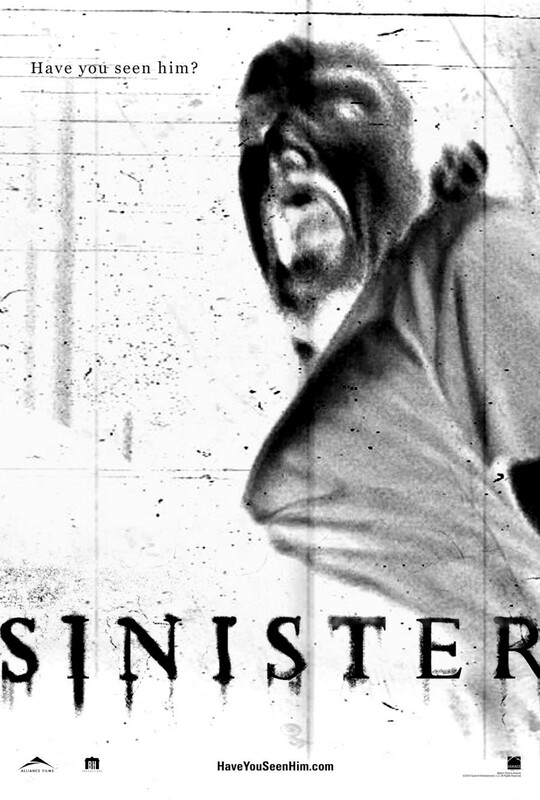 So if I were you, check Sinister out in your nearest movie theater. This movie will tell you that you’ll never know what you’re getting into until the very end. SINISTER movie rating by the pondering movie fan: 4.5 out of 5. Taken 2 was not even half as good as the first Taken movie. Its action scenes lacked intensity, its story lacked plausibility and the over-all direction just managed to increase its predictability. The first Taken movie astounded audiences around the world because of its superb direction, non-stop action and interesting premise: Bryan Mills, a former CIA operative whose daughter was kidnapped in Europe made the impossible possible by reclaiming his daughter after fighting henchmen of a big organized crime group. 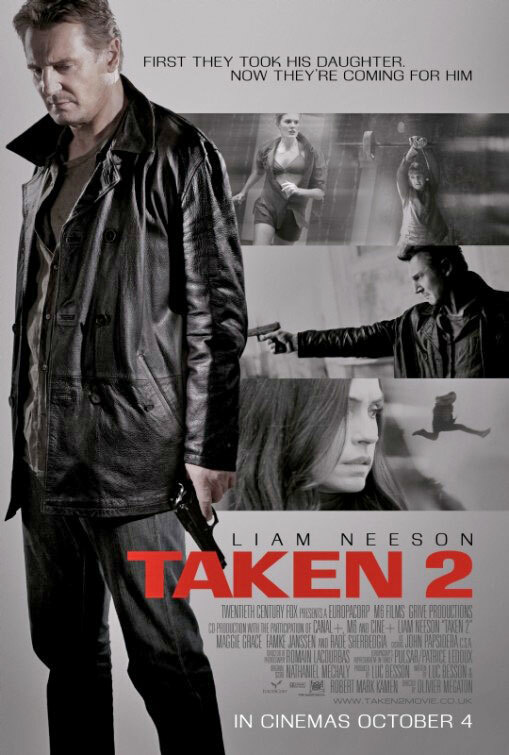 In Taken 2, the families of the deceased henchmen vowed to take vengeance against Mills. They went to Turkey to realize their plan of revenge as Mills was there because of a security work and a holiday vacation with his former wife and their daughter. Needless to say, they were taken, and it’s up to Mills and her daughter for them to escape and reclaim their lives once again. This movie was such a big disappointment. I guess it really has a big shoe to fill in as the first movie was a testament of a great action film. I dislike saying it but this sequel was a fluke. It was a horrible product of the producers’ idea of extending a father-out-to-get-daughter-back story. The story was so thin nothing grand came out of it. Moreover, if the plot did not work for itself, the directing and editing done in the film were not good as well. As a result, most of the actions scenes lacked the passion needed to make them great. If there was one thing that I could say was good in the movie, it’s the acting of the lead actors. Liam Neeson as Bryan Mills showed once again that he was credible to be a former CIA operative and supportive family man. It’s no doubt that he has both presence to command attention and charm to make himself a good fit for a lead role. Famke Janssen (Jean Grey in the X-Men movies) was good as Mills’ former wife. Their big age gap was not obvious because of their performances. Maggie Grace, who portrayed the daughter, lived up to the role given her. I guess it’s hard to portray a young female adult who’s like being trained to be like her action man father. The moral of the story is more blurred in Taken 2 than in Taken. It’s not right to kill, but it is if it’s your life that is at stake. This movie has not shown that; what it showed was overkill each and every time there’s a killing. The lead character even mentioned that he was going to do what he does best, referring to killing, when asked by his daughter what he’s going to do. What’s the implication of his response? That killing is cool, which is far from the truth. It’s obvious that the main theme of this movie is vengeance. They say that vengeance is a double-edged sword because it sure is going to hurt both parties involved. In fairness, the movie has shown this lesson along the way. But it should be emphasized further that vengeance tastes bittersweet, because no matter how fulfilling it may feel, there’s always that feeling it is plain wrong. There were talks for a Taken 3 movie. I’m not sure yet if this is going to push through but if it would, I hope it doesn’t fail like Taken 2.